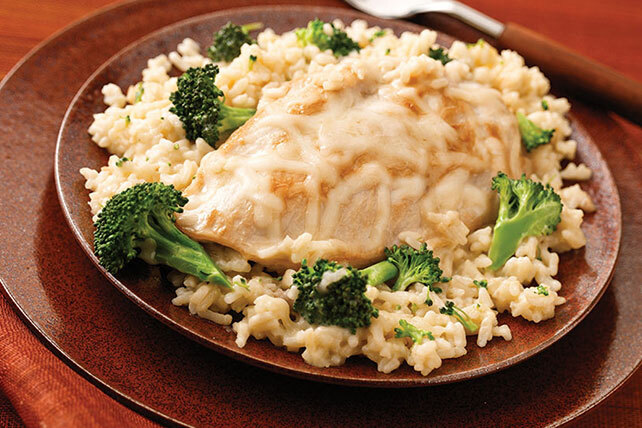 Make Mozzarella Chicken & Rice Skillet in 30 minutes. This better-for-you mozzarella chicken and rice is a family-pleaser and easy on the cleanup crew too. Heat oil in large nonstick skillet on medium-high heat. Add chicken; cook 6 to 7 min. on each side or until done (165ºF). Remove chicken from skillet; cover to keep warm. Add soup and milk to skillet; mix well. Bring to boil. Stir in broccoli and rice; top with chicken. Cover. Cook on low heat 5 min. ; sprinkle with cheese. Remove from heat. Let stand, covered, 5 min. or until cheese is melted. Use whatever frozen vegetables and shredded cheese you have on hand, such as peas and KRAFT 2% Milk Shredded Cheddar Cheese.